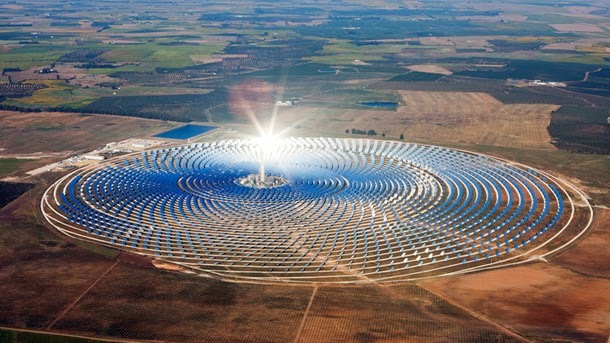 It’s not a mirage; there really is a city-sized solar-panel plant being created in Morocco. The project aims to provide the country with half of its energy by 2020. Ouarzazate, a city on the edge of Saharan desert, is being used to create what will become the world’s largest concentrated solar power plant. Its first phase, called Noor 1, will go live next month. The mirror technology it uses is more expensive than the more common photovoltaic cell, but it is able to produce power even when the sun goes down. This is all a part of Morocco’s plan to turn untapped desert potential into raw, renewable power – and from here, it looks like a fantastic plan. Morocco is taking on that challenge, with its 500,000 cells looking to produce enough energy to power a million homes, and with some in reserve to sell to Europe. There is also another set of aims: to expand the project to the Middle East, and especially Mecca. The Moroccan Agency for Solar Energy (MASEN) said such expansion would not only encourage resource independence, but would increase stability and harmony between states. The political utopia projected by such an image is pleasing: the world brought together by its shared use of clean energy. But don’t get too excited yet: if there’s one thing that divides the political sphere, it’s energy. There’s probably no easy rollout in the future for such a huge project, but the fact an emerging economy like Morocco’s is taking such a step is welcome indeed.